I like a good medicinal taste to my drinks - anything with a hint of iodine and/or the antiseptic whiff of a good bandage makes me happy. By accident my contribution to this months Mixology Monday lands firmly in the cleaning cupboard group of drinks - the Collie taste like something that could clean out a dusty old room right quick. While many of us today think of overly sweet and unimaginative uses of fruit juice combinations when we hear of nonalcoholic beverages, there is a growing resurgence and movement of creating real craft “mocktails” in cocktail bars around the world… As such, this month’s theme challenges you to create unique craft “mocktails” only limited by your imagination. Perhaps you have an abundance of that homemade lavender syrup sitting in your fridge? Maybe you’ve been thinking about creating a non-alcoholic version of your favorite cocktail. Or maybe you just wanted an excuse to mix up an Angostura Phosphate you saw in Imbibe. Oh yes, non-potable bitters are fair game here since they are legally classified as nonalcoholic in the states. However, if the Teetotalist inside of you won’t allow it, you can go without them. Cheers! Truth be told I've never tried my hand at mocktails before - and I'm glad I didn't have to serve The Collie for unsuspecting guest. I does however grow on me as I drink and write. 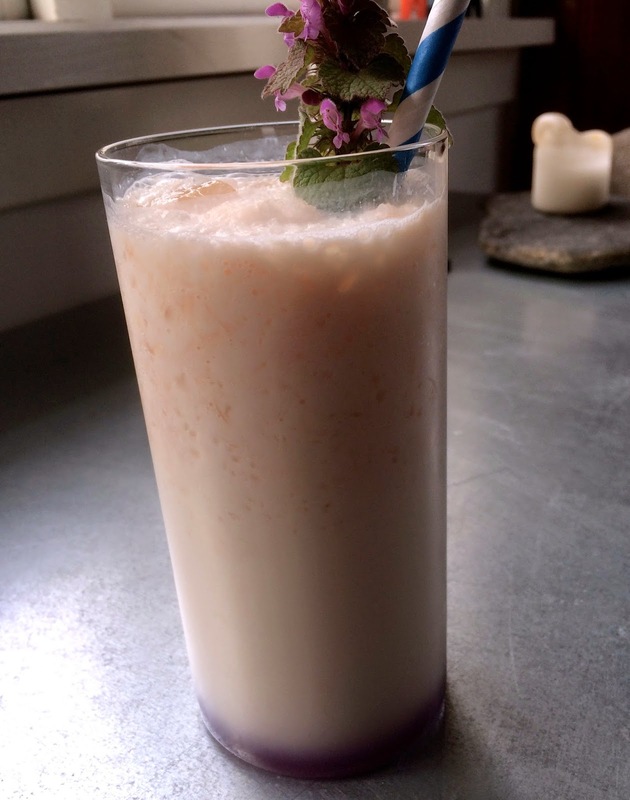 I wanted to start out from a platform of the Indian yogurt drink called Lassi - and started by ruling mangos out, the fruits available at this time of year in Denmark are rock hard and taste like imported apples. I looked at my fruit basket and saw a grapefruit and appointed that star of my creation. The name? Well it springs from a childhood book about a certain dog almost named Lassi. Put the ice, yogurt and grapefruit in the blender jar and pulse until the ice is brushed. Add the ginger beer and pulse a few times - don't let the blender kill the fizz from the ginger beer. Pour into Collins glass - add the violet syrup that will settle on the bottom ready to be agitated by a straw and garish with some kind of purple flower.